Even if you don’t consider yourself a gamer, you probably know about Magic: The Gathering. Ever since its creation in 1993, Magic: The Gathering has taken the world by storm as the most popular collectible card game. An estimated twenty million people play Magic. How seriously all of these people play, I do not know, but twenty million is still an impressive number nonetheless. Our regular player base here at the café is only a teeny tiny little fraction of that, but we still boast a fairly decent number. I can say with certainty that our Magic events consistently have the highest turnout of any of our events. Our Aether Revolt Pre-Release event was at max capacity and we already have a lot of people signed up for our Game Day event this coming Saturday. 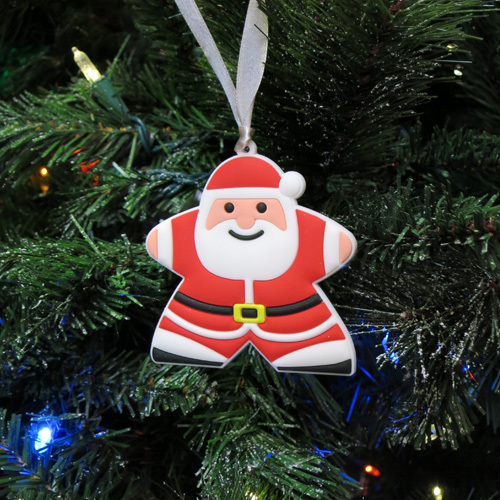 If you’d like to check out the new set, we have plenty available in the café. And, of course, Game Day is coming up this Saturday, the 11th so sign-up now to ensure your spot! 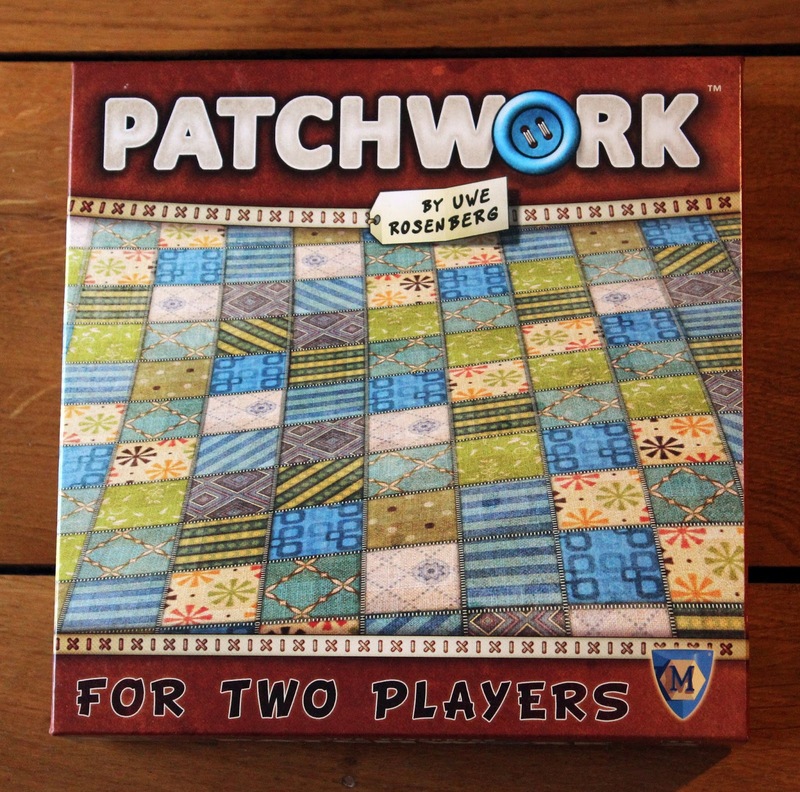 Patchwork is a game in which you and your opponent are competing to create the best quilt. “A game about quilting?” you may ask. 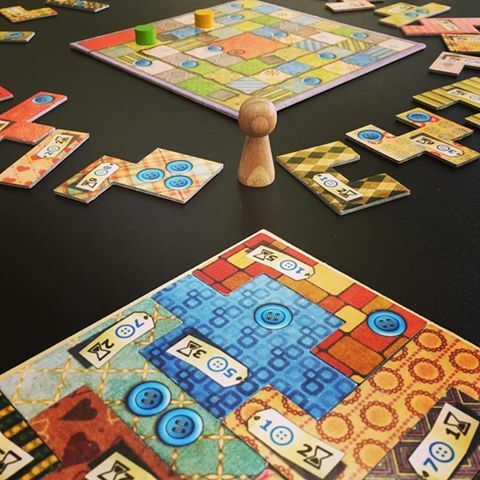 Don’t be fooled by the game’s theme and adorable artwork; Patchwork is an abstract puzzle game that requires surprising amount of thought and decision-making. In it you use buttons to purchase new patches to place on your quilt, trying to leave as little empty space as possible. The patches on your quilt will also earn you buttons and by the end of the game, the player with the most buttons is the winner. Any empty space left on your quilt will be subtracted from your button total. We love Patchwork because the concept is incredibly simple, but there is a surprising amount of strategy involved in purchasing your patches and placing them on the board. The patches are shaped in a way that is reminiscent of the shapes in Tetris so fitting them together without leaving empty spaces (you don’t want empty spaces because they are worth negative points at the end) is a large part of the strategy. You also want to try to plan your own purchases and movement in a way that impedes your opponent from purchasing future patches you think you may want. A lot of people end up having negative points the first time they play, but people still enjoy the game in spite of that and are generally eager to try again and get a better score. And it has a great replay value as the order of the patches you can purchase will always be different. In fact, there have been several times where people have come into the café and say to us, “We want to play the game we played last time we were here with patches and buttons.” Not only is it a favorite of ours, but it seems to be a customer favorite as well. For a pair of two looking for a more intensive strategy game, Battleline is probably what will be suggested to you. Battleline is a favorite of Evan’s who believes that there is no better one on one strategy game than Battleline. 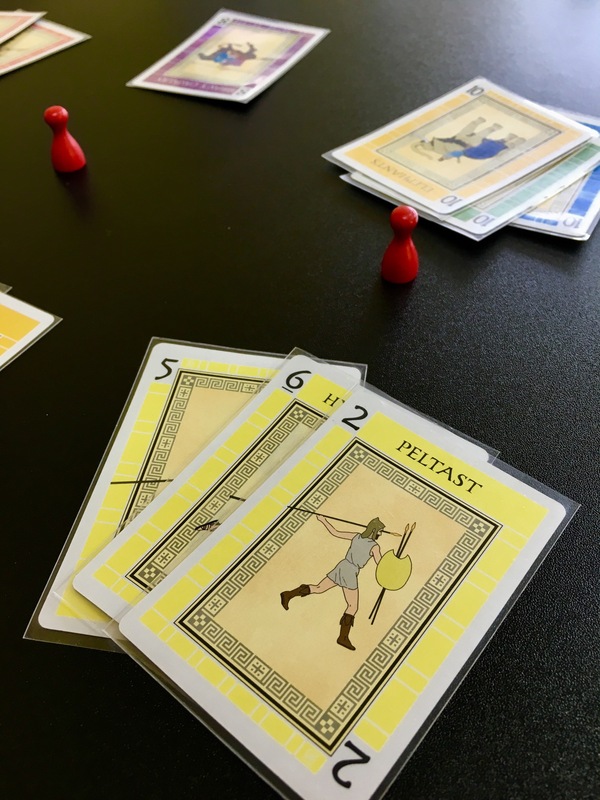 In Battleline, you create different combinations of cards in order to best your opponent and capture flags. The combinations exist in a hierarchy of power, similar to poker hands in that a flush is going to beat a straight; for example, having three cards of the same value will beat having three cards with the same color. Each flag on the “battlefield” will have cards added to it by each player until three cards are on either side and that flag is claimed by one player. In addition, there is a separate deck of cards with different abilities that can help you. The strategy is in knowing where and when to place your cards and trying to anticipate what combinations your opponent is creating so that you can create one that will beat theirs. Almost everyone who has played it here has enjoyed it, especially players who love higher level strategy games. People enjoy trying to out-think their opponent as they fight over the flags. Remember that pair I mentioned earlier in this post? A woman and her son who had been in previously in the week and had learned Battleline from Evan. They enjoyed it so much that they returned to play again and see if they could get a better grasp on the game. These can currently be found on the “Staff Picks” shelf in the cafe! 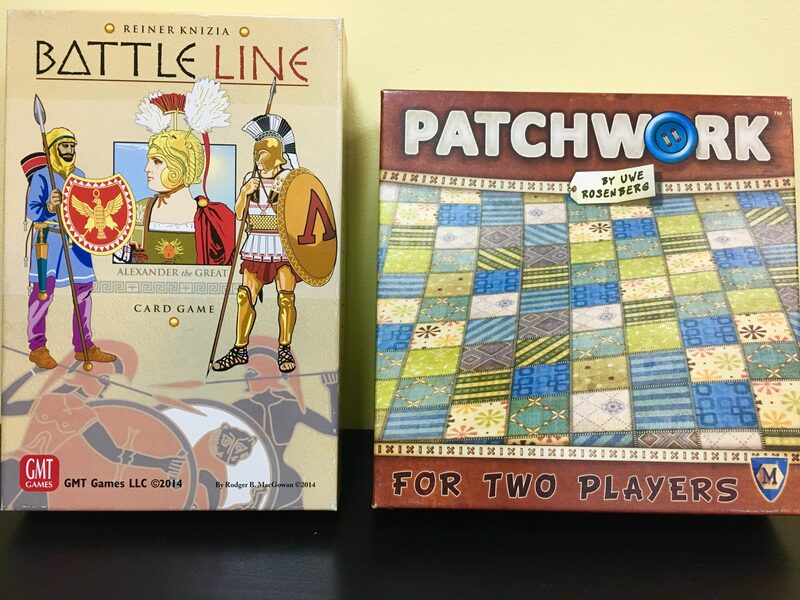 Next time you’re in the café and need a game for two, whether you’re on a date or hanging with a friend or family member, be sure to check out one of these great games for two! Unless you’ve been living under a rock for the last couple of years, you know that the Star Wars franchise has been rejuvenated with the addition of new stories in the form of a new trilogy and plenty of spin-off movies in the works over the course of the next several years. Of course, this means that now is the perfect time to cash in on the series’ newfound popularity (not that Star Wars has ever not been popular, mind you). That means new merchandise—and lots of it. There are new tee-shirts, posters, toys, LEGO sets, and, most importantly from our perspective, games. There of course have been new Star Wars themed Monopoly’s and Life’s and plenty of video games, but a game that we have seen become a huge hit in our café is Fantasy Flight Games’ Star Wars Destiny. Star Wars Destiny was first released not long after Thanksgiving and almost immediately we ran out of booster packs. There was a seemingly long period of time between that and our next shipment of booster packs in which many of our customers (and even some employees) waited in agony. We got frequent calls wondering if we’d finally gotten more boosters in and even some people wanting to reserve a whole box. We even investigated other gaming stores in the area, but it was the same story everywhere we went: sold out. Finally, just before Christmas, we got the shipment in and once again, the boosters were gone in a few days. So what is this new game? 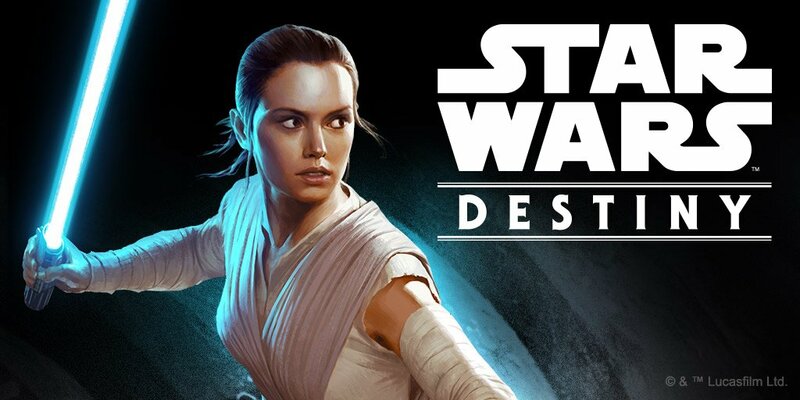 Star Wars Destiny is a collectible card game similar to Magic: The Gathering in which you build a deck consisting of characters, weapons, vehicles, and abilities and use it to battle your opponent. In addition, there is a dice component to the game in the same vein of Dice Masters. Certain cards come with a die that you must use with the card in order to attack your opponent. Why is this game so popular? Well, first of all, it’s new. As with most “new” things, there is a bit of hype surrounding it. People are curious and gamers especially have a desire to check out the newest games. Secondly, as I’ve talked about before in regards to Dice Masters, people are attracted to collectible card games because of the excitement they feel from collecting new cards and building new decks. But perhaps most importantly, it is a new Star Wars game. Star Wars is one of the biggest, most beloved stories to ever grace the big screen. 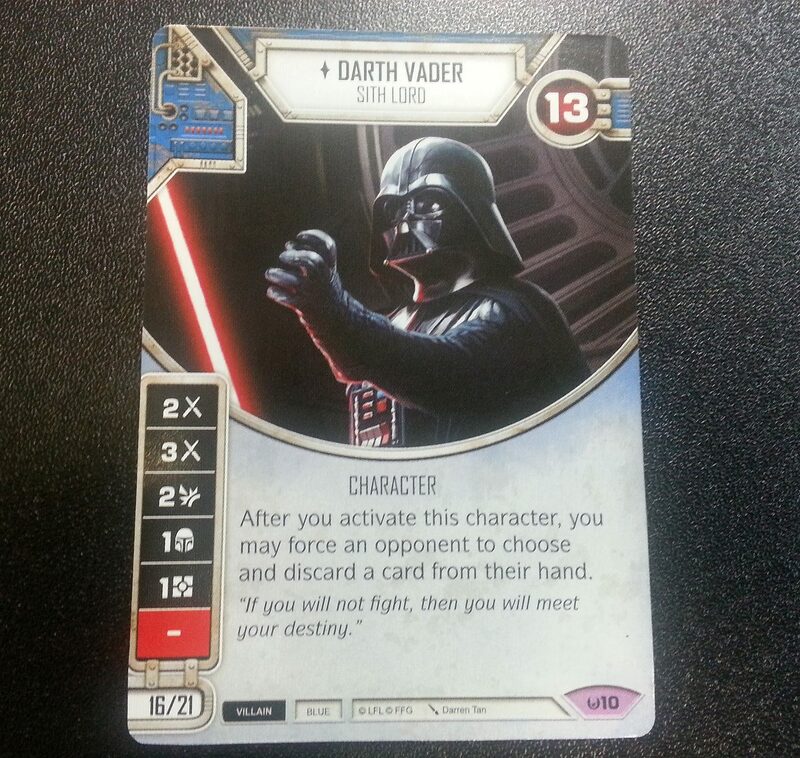 Players enjoy opening booster packs and looking for their favorite Star Wars characters to add to their teams. And, as with Dice Masters, trying out different combinations of characters is part of the fun. Do you want Darth Vader to team up with Kylo Ren against Han Solo and Boba Fett? Star Wars Destiny will let you do that. Although this game has only been out for a little more than a month, it already seems to me that it is a big hit. Only time will tell if it continues to grow in popularity or eventually dies out. Plenty of other collectible card games have come out in the past, all trying to emulate the success of Magic: The Gathering. Few have succeeded, but it seems that, at least for now, Star Wars Destiny just might. Above all else, a board game café is meant to be a fun social place for people to hang out, play board games, and enjoy good food. 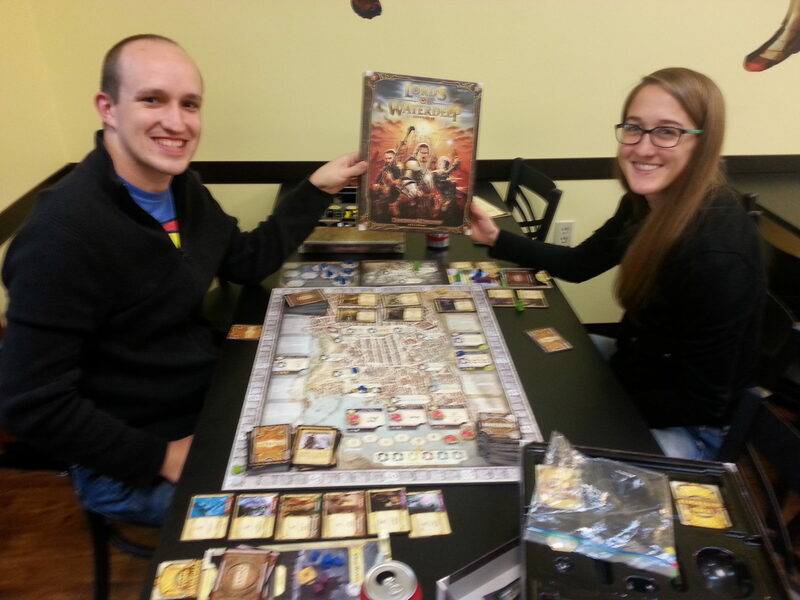 Following the growth in popularity of board games in recent years, board game cafes are popping up all around the country. Board game cafes are a way to get out from behind the computer or tv and interact face-to-face with family and friends in a more personal and meaningful way. They are an inexpensive option to the ever-rising costs of movie tickets or even a night of bowling. So what exactly is a board game cafe? During the week of Thanksgiving in my junior year of college, my Intro to Game Design professor announced that we would be having class the day before Thanksgiving, but it would be a bit different. Instead of meeting in our usual classroom setting, anyone who hadn’t already traveled home for the weekend would journey down to the cool new gaming café just a block down from the university’s library. Of course, I was one of those who would already be on a train home, but I heard from my classmates what a fun and unique experience they’d had and gathered up my own group of nerdy friends for a trip to New York City’s The Uncommons. This was my first experience with a board game café and it certainly wouldn’t be my last. In fact, it was those many days spent in that cramped, little café in Greenwich Village that inspired me to approach Tom about a job when I saw that The Game Table Café was opening up in little old Mechanicsburg. So, what is a board game café? Each café varies in how things are done, but essentially, when you break it down to its most basic parts, a board game café is a regular café with a great menu of food and coffee that also contains a library of board games available for customers to play. In addition to coffee and espresso drinks, some cafes will serve food, snacks, or even alcohol. And nearly every café charges some form of cover to play games. Most, like us, take the flat fee approach, charging a fee that allows you to stay all day and play as many games as you like while others will charge per hour or per game. Unlike cafes such as Starbucks that make their money by getting people out of the door as quickly as possible, we want you to stay and have fun. 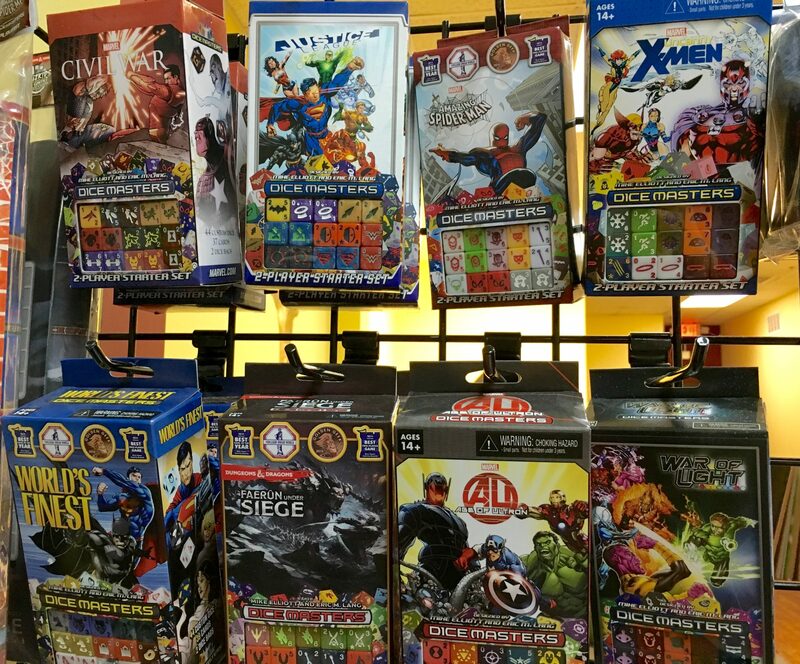 Board games are more popular now than they’ve ever been which means that more and more games are being made with plenty of smart and unique concepts. Beyond the classics of Monopoly, Apples to Apples, and Sorry; there are a host of new titles coming out each year. Most cafes only have a few hundred games available on their shelves, but there are thousands of them out there. If the word “thousands” makes your head spin then you aren’t alone. We have a lot of regular gamers who are familiar with most games in our library, but more frequently we get customers who come in and stare wide-eyed at our wall of games and say, “I had no idea any of these games even existed.” They know Monopoly and Life, but, for the most part, two-thirds of our library is foreign territory for them. If this sounds like you, fear not! Board game cafes employ “game gurus” who are more than happy to pick a game for you based on your past gaming experiences and teach it to you. You can learn a new game without even opening the rule book. The Game Table Cafe strives to help everyone connect. We have a great selection of food, coffee and baked goods just waiting for you to enjoy. Our game library is just over 400 games and we are here to help you find just the right game and perhaps connect with a new or old friend. 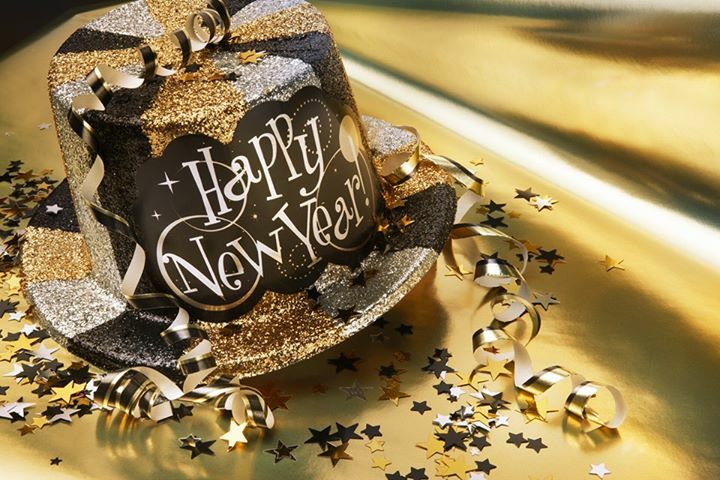 Watch our Calendar of Events for special events going on each week. 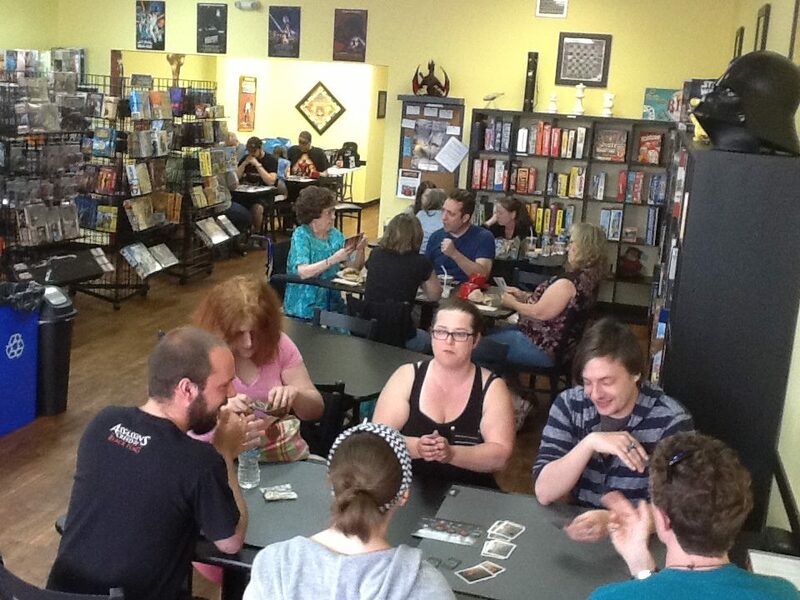 With thousands of games to choose from, there is a game for everyone and a board game café is a great place to find a good game, connect with a friend and enjoy great food and coffee. It doesn’t matter if gaming is one of your great passions or simply a casual hobby; everyone can enjoy an evening with friends or family at a board game café! 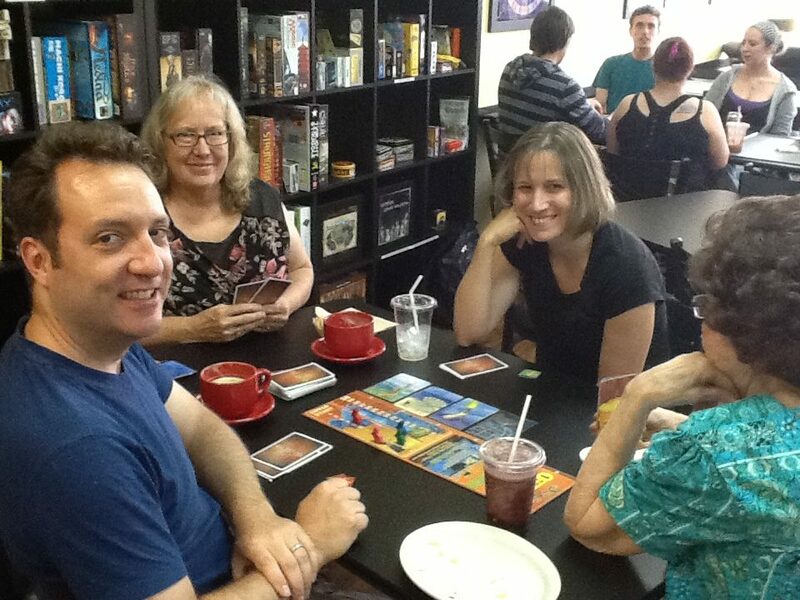 At The Game Table Café we believe in combining great food (sandwiches, baked goods and Coffee) with great board games. One of the games that gets a great deal of play in the Café is Dice Masters. We always have a great turnout for our tournaments and see plenty of boosters being opened. But what is it about Dice Masters that makes it such a popular game? What about the game attracts players? While I do not regularly play myself, there is a genuine interest in the game and our players from Central Pennsylvania truly enjoy playing it. So what is Dice Masters? Dice Masters is a collectible, dice-drafting game for two players. 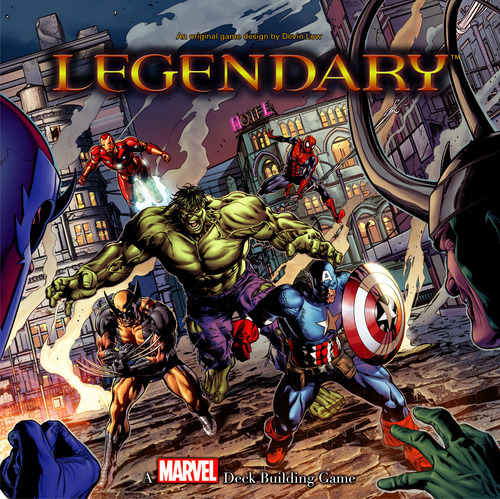 It combines characters from many different franchises from DC and Marvel Comics to Dungeons and Dragons to Yu-Gi-Oh. You collect cards and matching dice and assemble a team of characters to battle other players. You play by rolling your dice and then either using them to draft character-specific dice to add to your pool or deploying them to attack your opponent. The player who depletes their opponent’s 20 life points wins. 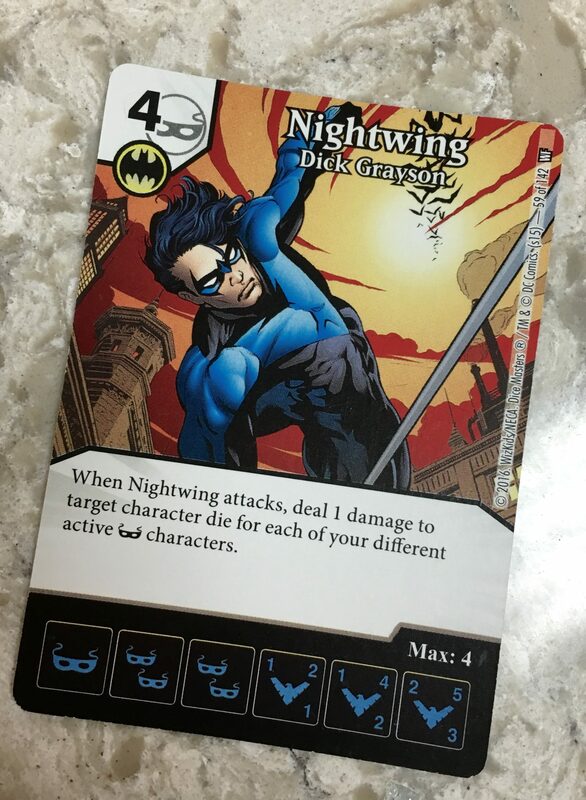 When I first started working at The Game Table Café, I briefly ventured into Dice Masters, buying the booster packs in the hopes of owning the Nightwing card. Nightwing is my favorite superhero and with boosters being only a dollar, why not try for him? This desire to own my favorite character’s card is something that I have in common with a lot of Dice Masters players. I have watched as customers bought dozens of packs and then sat down and opened them, excited to see what they would get and eager to trade with friends. With the rise of Magic the Gathering in the 90’s, many have tried to emulate the success of the collectible card game and few have succeeded. Dice Masters is one of those few. There is a great deal of fun simply buying boosters and collecting your favorite characters. With so many different characters to choose from, there are hundreds of different combinations you can try when creating your Dice Master team. 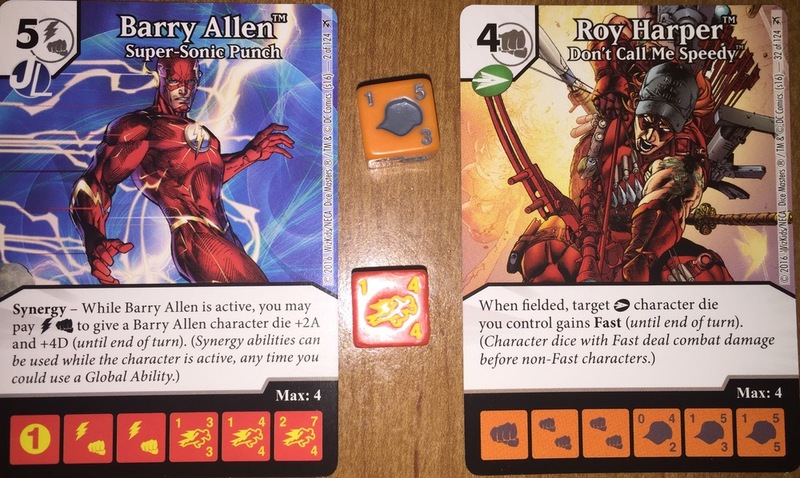 For me, one of the most enjoyable aspects of Dice Masters is that you can finally answer this age-old question: “Who would win in a fight?” For whatever reason, superhero fans love pitting their favorite characters against each other. 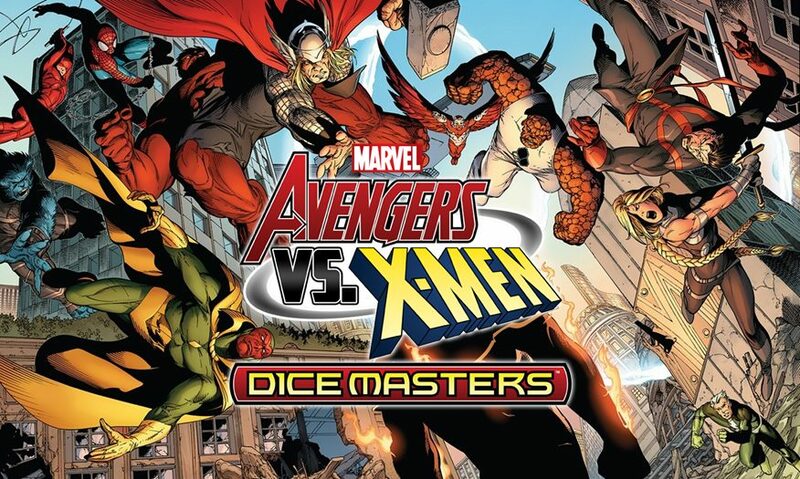 While Captain America and Superman can’t exactly fight to the death in comics, in Dice Masters, you can make that happen. What if Harley Quinn and Iron Man teamed up to take on Wonder Woman and Doctor Octopus? What would happen if we pitted all of the Bat family characters against all of Earth’s Green Lanterns? What if all of the superheroes suddenly had monsters from Yu-Gi-Oh cards at their disposal? These questions may never be answered in comics, but you can play out these and many other exciting scenarios in Dice Masters. But enough from me. I asked our resident Dice Masters expert and some of our regular players what they enjoy about the game. Of course, one of the popular answers was collecting characters and Dice Masters is fairly inexpensive compared to other popular CCGs. Dice Masters players enjoy using these characters to experiment with different teams and then see how their teams stack up against the teams of other players. The strategy element of the game was cited as another important aspect of the game. There is a bit of luck involved in the game between the blind drawing of dice from your bag and then rolling said dice, but the strategy comes in when deciding what to do with those dice. Do you want to spend energy to buy more dice or send dice out to the field? Do you want to risk re-rolling dice? Do you want to attack even if you know you’ll get blocked? There are many choices to make during play so that players can turn even a bad roll into good, strategic gameplay. Well, there you have it! 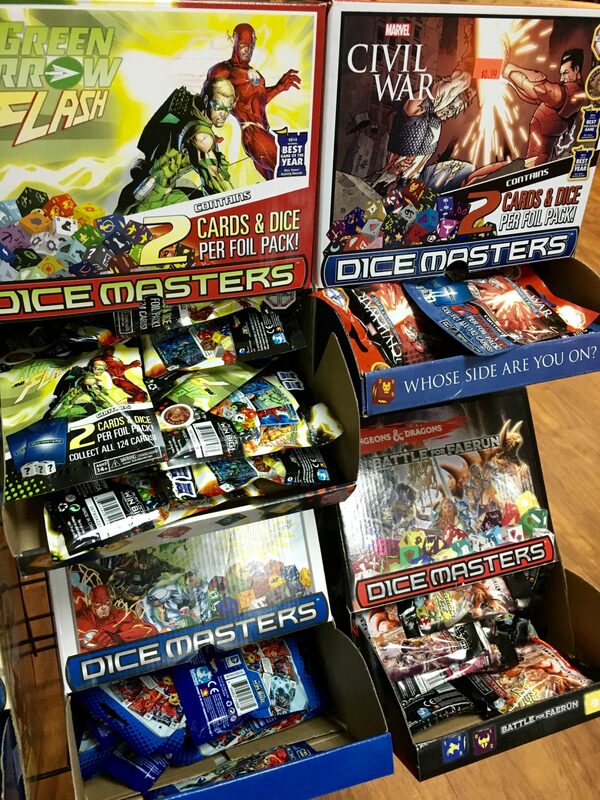 If you enjoy strategic, nerdy, collectible, battling games for two people then Dice Masters would be great for you. Over the past few months, I’ve seen many different types of people playing this game—men and women, adults and children. 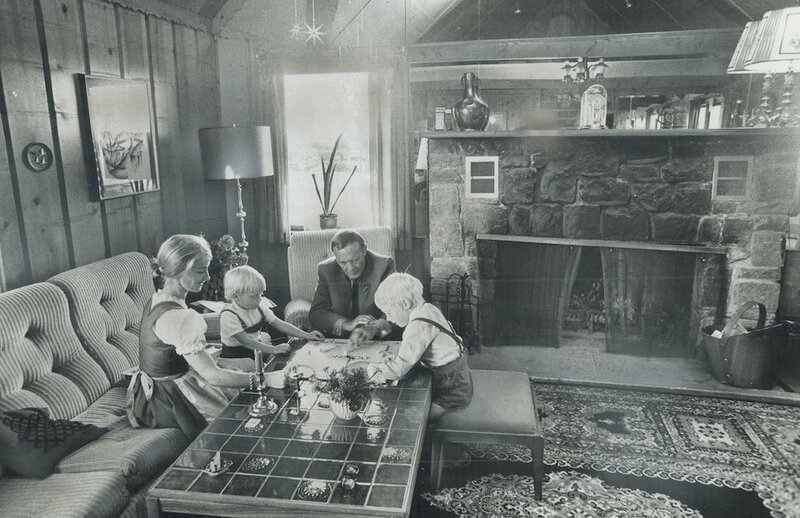 Families come in and play together. Only two weeks ago a father and his daughter came in wanting to learn to play. While Dice Masters may be a strategic or even competitive game, it can be learned by anyone and anyone can have fun playing it. We have a starter set in our library so if you fancy a game of Dice Masters come to The Game Table Café and we would be more than happy to teach it to you! on Zombie Island—but not everyone has a go-to spooky game to play. 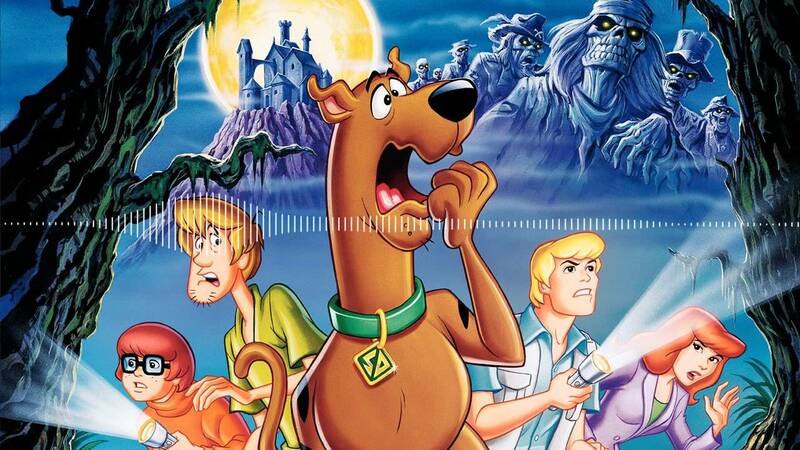 With the scariest day of the year right around the corner, now scooby-doo-zombie-islandis a great time to talk about some of the newest horror games available for you to play on Halloween. 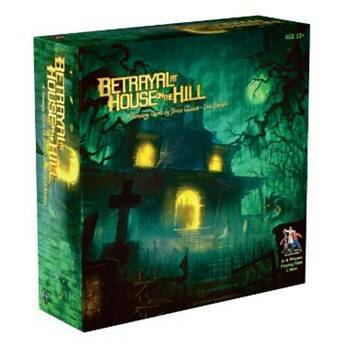 We’ll start off with one of my all-time favorite games that now has an expansion sure to make it even bigger and better: Betrayal at House on the Hill. 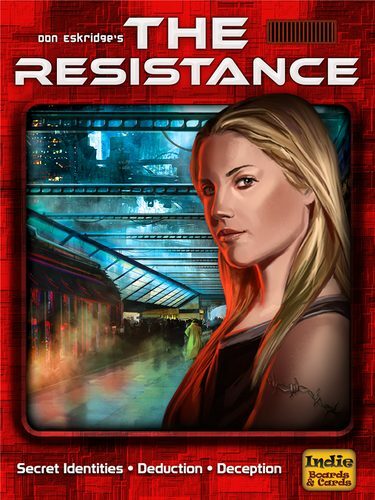 I was introduced to this game at college by my sophomore year floor-mates. 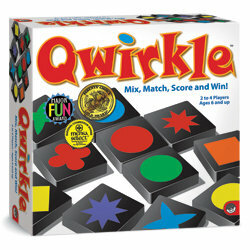 We would get together often for the sole purpose of playing this game, even when we no longer lived together. 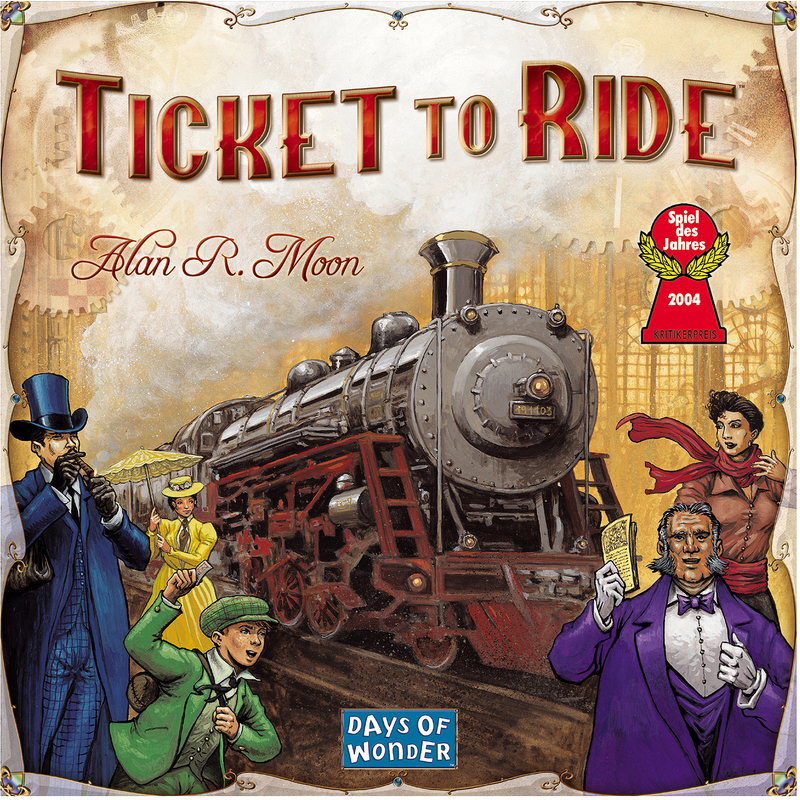 It is one of my favorites because, despite how many times I’ve played it, each time is completely different. In case you do not know how this game works, you play as one of several characters who venture into a haunted house and begin exploring it. You will encounter many creepy things as you make your way through the house until, eventually, one of you will turn traitor. At this point, the whole game changes. Instead of exploring the house you are now collaborating to survive “the haunt.” Or, perhaps you are the traitor and are trying to kill the other explorers. You won’t know what is going to happen because there are 52 different possibilities and the chances of playing the same scenario twice in a row are slim. In one game, you may be running away from a horde of zombies while in another, an alien is trying to take you and the house back to his home dimension. You never know what sort of horrors await you in the house on the hill and Avalon Hill has now added an expansion with even more haunting scenarios to play. 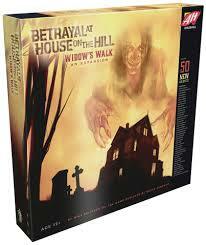 Betrayal at House on the Hill: Widow’s Walk comes with two haunt books containing 50 new haunts full of new monsters and creatures. Players can now access the roof, a previously unexplored level of the house with 20 new room tiles. Finally, there are 30 new omens, events, and items and 76 new tokens. The game is officially available as of October 14 and I, for one, am excited to check it out. Dead of Winter is a game that I have wanted to play for a while. It has been on our shelf since we opened, but I have yet to get the chance to play it. Dead of Winter is a story-centric game taking place in the post-apocalyptic world where zombies have plagued the earth. Players work together to find a way to survive, fighting off zombies and finding food and supplies. It is possible to play with a traitor who is trying to sabotage the rest of the colony which adds another level of chaos to the game. Plaid Hat Games recently published a stand-alone expansion for Dead of Winter called Dead of Winter: The Long Night. 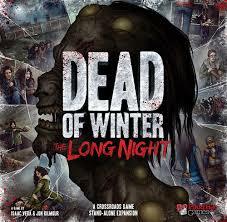 As a dead-of-winter-long-nightstand-alone expansion, The Long Night can either be played by itself or it can be added to the original game to enhance gameplay. The Long Night features a new colony location as well as new characters, new zombies, new items, and new objective cards. If you’re a fan of the zombie apocalypse genre then this is a game worth checking out. The final game on this list is Mansions of Madness Second Edition. 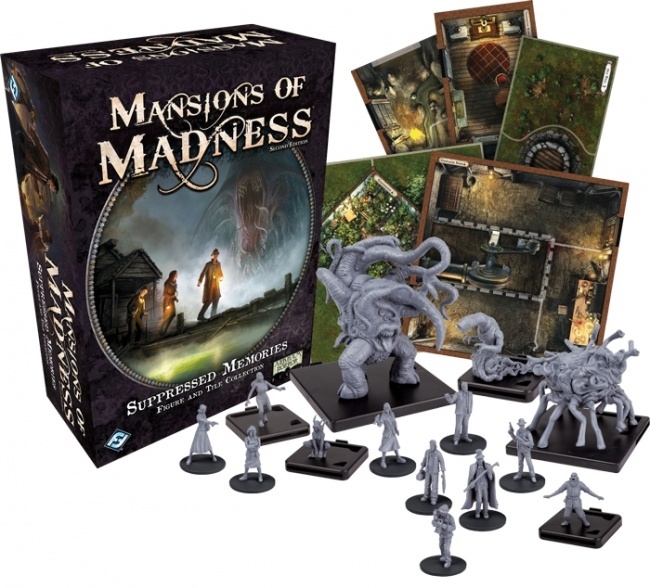 Mansions of Madness is a co-op game inspired by the works of H.P. Lovecraft. In it, players explore the mysterious world of Arkham and encounter plenty of monsters and strange scenarios along the way. There are plenty of characters to play as, each with their own stats. Mansions of Madness is another game that I haven’t played. In fact, I hadn’t even heard of it until the second edition arrived at the Café. However, now that I have learned more about it, I am intrigued and would love to break this game out sometime. So, what’s new in the second edition? Essentially, Fantasy Flight Games have incorporated the use of technology into the game and created an app to run the game for you, removing the role of the Keeper from the previous version, making the game fully cooperative and allowing for easier setup. The app generates each scenario and all of the tiles and events. The second edition can also be combined with any monster figures and map tiles you have from the first game using the conversion kit included with the game. The app is available for iOS, Android, Mac, and Windows and can even be used on Steam. If you’re looking for a game to play on Halloween, all of the above are perfect options. Widow’s Walk, The Long Night, and Mansions of Madness Second Edition are all available for purchase at The Game Table Café while Betrayal and Dead of Winter are available in our library to play so drop in and check them out or come join us on the 29th for our Halloween Costume Party!